There are 4 paintings that you will finish. Each painting you will learn something new. Correct paint consistency. How to properly load you paint brush. You will learn ; to paint sky and clouds; trees ,bushes, barns, highlights and shadows. I will teach you how to use a pallet knife; paint lakes that moves; waterfalls; mountains. Series # 1 is teaching you how to paint on a white canvas using the proper technique. 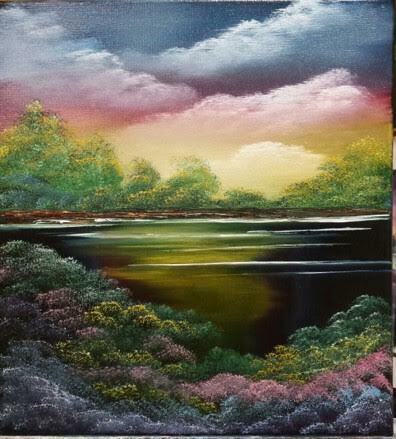 Series # 2 is teaching you how to paint on a black canvas using the proper technique. I will teach you all of the secrets using oil paint. So much to learn. Come join me, let’s have fun. If there is a time that suites you better, call me. Open Studio, is for anyone that wants to learn or needs help to advance to meet their gold as an artist. Come join me. It’s a lot of fun. Call for more information about OPEN STUDIO. Same hours as Wet On Wet. 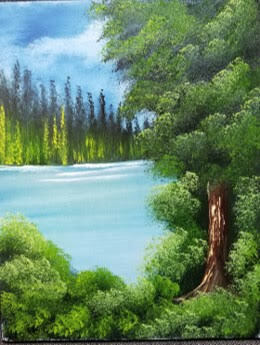 Brush Strokes: Come and learn Brush Strokes using a single color and learn how to double load a brush using two colors. Learn the correct paint consistency, and how to use both the round and flat brush. How to properly clean and condition your brushes. For information and a supply list call me.